Previously a Heavens-Blade wielder, a title given only to the twelve most capable fighters of the Lance Shelled City of Glendan, Layfon transferred to the Academy City of Zuellni in hopes of leaving his violent past behind.The main protagonist of the series. 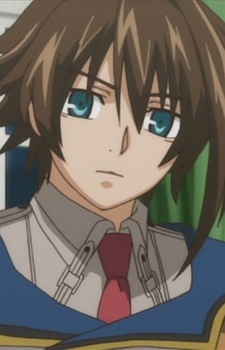 In the novel, he is described as having tea-colored hair and blue eyes. He was one of the twelve wielders of the Heaven Blades and also held the title of Wolfstein at the age of ten. He and Leerin were found by Derek during their early childhood and taken to the orphanage in Grendan. Due to Derek's inability to earn enough money (because of his old age and the fact that he had retired from the battlefront), Layfon decided to earn money fighting in matches in order to provide for themselves and the other orphans. He began to participate in illegal underground matches to earn even more money for the orphanage.